Cosmoline is a viscous waxy coating used for corrosion prevention and surface protection. There are many different brands each with varying properties. Cosmoline consistency is similar to thick molasses when wet and tough wax when dry. It is designed to stay on many kinds of surfaces at very high or low temperatures and is highly resistant to water. Removing Cosmoline is difficult because it is designed as a protective coating. Once cosmoline dries to a waxy film, it is difficult to remove and water does not wash it off. Hand washing with solvents is the predominate method used for cleaning cosmoline in many industries. Hand wiping with solvent is slow, hazardous and labor intensive. Cosmoline removal from new parts for repair and rebuild is difficult with manual cleaning methods. A StingRay aqueous parts washer easily removes cosmoline. Cosmoline removal in a StingRay is a product of the proper aqueous cleaning process. Removal of cosmoline with a Stingray aqueous parts washer requires all four cleaning factors. A washing temperatures above 185 degree F (85 C), the proper mild alkaline detergent with low foaming characteristics (Power Kleen V is very successful,) a high hydraulic impact pressure with a power density of .7 or more, and a short 15 to 20 minute power wash cycle using the unique oscillating manifold in all Stingray parts washers. Cosmoline removal from new planet gears is quickly accomplished in a StingRay industrial parts washer. Results of a 15 minute Power Wash show complete cosmoline removal. "Click image for larger view." 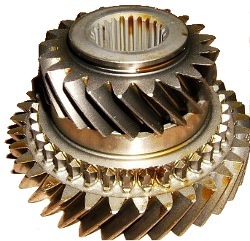 New replacement parts such as gears and precision steel parts are packaged with cosmoline to prevent rust until they are needed for repair. Removal of the cosmoline with a a StingRay Aqueous parts washer is an ideal method that saves manual cleaning labor, eliminates hazardous cleaning solvents and speeds up repair processes. A StingRay puts your valuable service technician to work repairing equipment instead of cleaning. Most StingRay washers pay for themselves in reductions in cleaning labor. Using the StingRay parts washer yields more throughput with the same number of repair technicians. StingRay SR12090 Parts Washer ready to clean off cosmoline. Cosmoline from new replacement gears and carriers is easily removed in short wash cycles utilizing the proprietary Power Wash process. Power washing uses the hydraulic impact of the heated cleaning solution. 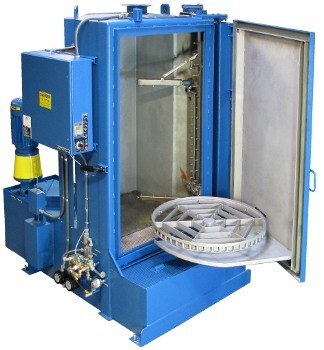 The unique oscillating power blast manifold blast parts with high temperature cleaning solution at a different angle of attack with each revolution of the turntable. After the washing cycle, a fresh water rinse removes cleaning chemical in a closed loop zero-discharge process. Parts are cosmoline free, rust proofed and flash dry in under two minutes. Cosmoline removed from gearbox planet gears in a 15 minute wash with a StingRay SR12090 Parts washer. This custom US gear manufacturer and gearbox repair company eliminated cleaning by hand in solvent tanks with their new StingRay Industrial Parts Washer. "Click image for larger view." Green aqueous chemistry eliminates manual cleaning using flammable solvents, acetone and WD-40. StingRay parts washers use a non-flammable alkaline cleaning detergent such as Power Kleen V or Power Kleen IIIL. Water based chemicals eliminate the risk of fire. Alkaline detergents are less expensive to ship and cost less to dispose of than petroleum based chemistries. A low cost rust inhibitor injected into the rinse system coats the freshly cleaned steel parts and prevents flash rusting for several days up to two weeks to allow components to be used in assembly processes without spray on rust prevention like oil or WD 40. Additionally, employees are no longer exposed to the hazardous solvents and obnoxious odors of solvents used in manual cleaning processes. A StingRay parts washer removes cosmoline using the unique power wash process. The optional SHIM doubles power density and increases impact energy to make cosmoline cleaning fast, low cost and without hand detailing.